Why should runners perform the plank? A stronger core will improve your posture, help you run faster, prevent injuries and even make you look slimmer. We planks – that King of core exercises – do more for ab strength (and definition, if your body fat is low enough) than any number of crunches and sit ups. For flat abs, you want to be pulling the core in, after all, not building it up with endless muscle-building curl movements. Here’s how to perform a perfect plank for better running performance. The plank helps you build a strong core by resisting force, using your body weight. You can do it anywhere and you don’t need any kit. Remember: you are forming a stiff plank with your whole body from head to toes. Get into a press up position, and put your forearms on the ground underneath your shoulders. Your elbows should be under your shoulders, and your toes on the ground. There is a straight line from heels to head. 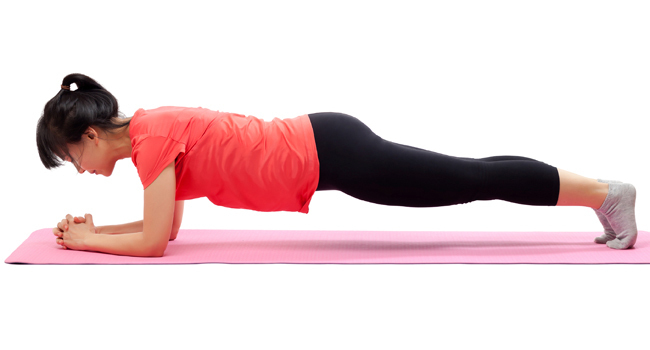 As you plank, stay strong and keep your entire body firm. Think about lifting up at your core (we like to imagine there’s a candle flame under our bellies! ), keep the shoulders down and away from the ears, and remember to engage your glutes. Keep your neck neutral (relaxed, neither looking up nor down). Try to hold this position for 15 seconds. If you can do that, great, work up to 30 seconds, then a minute. Once you can plank with good technique (not slouching) for a minute, take a short break and repeat up to four times. – Don’t look down at your hands or at the ground, even when the plank gets tough. Keep your eyes looking about 2 feet on the ground ahead, to maintain a neutral spine. – Don’t be a hero. When your form starts to flag (and you start to sag), gently lower onto your knees and come out of the plank. Try again after a rest, or leave it for now and try again another day. You’ll be pleasantly surprised by how quickly your body will adapt to the demands of planking, and you’ll be amazed by the positive effects this core exercise has on your posture, your strength, your running performance and your ability to perform every day tasks (like lifting and carrying) more safely.